The exhaust system ensures toxic exhaust fumes stay out of your car cabin and works to make your engine run correctly. It also helps give you the best possible fuel efficiency and cuts emissions that pollute the air. If you hear vibrating when your car is running or if it experiences a loss of power, bring it in for a free exhaust inspection. Let the shop know where you noticed the vibration coming from the steering wheel, operating pedals, or even the seat. 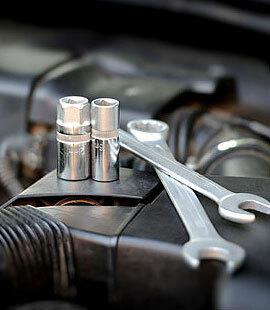 This symptom could be a result of a hole, disconnected part, or a leak in the exhaust system. The problem may or may not include a rumbling sound – that depends on the size of the damaged area. The vibrations are not just signaling a problem with the muffler or exhaust… they are also signals that your motor is likely not performing at peak levels. If you notice your regular fill-ups aren’t getting you as far as they used to, take your car to a local service center for an inspection. As with vibrations, loss of fuel efficiency might be a sign of a car exhaust system problem. Exhaust leaks make your motor work harder, which requires more gas.